Elsewhere in early morning Washington D.C. Eloise Abernathy’s friend Michelle, the only one of the friends left behind by the transporter beam, desperately pounds on the front door of Lisa Abernathy’s apartment. Lisa opens the door, wondering who on earth it can be at six o’clock in the morning? Michelle spurts out that everybody has gone and Lisa realises that she must be referring to her daughter. Michelle explains that last night she, Eloise, Mark and Kevin had been hiding out in Kevin’s father’s store when they were discovered. She adds that Eloise was only acting in good faith, trying to protect him. When Lisa asks who “him” is and whom they were protecting him from, Michelle replies “It was the Aliens! They were after Glitch!”. Meanwhile on the floor above Diana has been awakened by the commotion and is listening to the conversation from the window. She thinks to herself that she does not like the sound of all this and she has a sneaking suspicion who this “Glitch” might be! It looks like Wonder Woman’s work day has already begun! Below, Michelle continues that the children were kidnapped and beamed up just outside the Elementary School. Lisa tells the girl to calm down and come inside, while upstairs Diana uses her lasso to transform herself into her Wonder Woman costume. She creeps into Etta’s room heading for the window but her roommate begins to stir from her slumber, asking sleepily “who’s that?”. Diana softly tells her friend it is just her imagination and Etta duly turns over and goes back to sleep. Wonder Woman then opens the window and steps out onto the ledge before launching herself into the sky riding the air currents. She muses to herself that Steve had signalled to her via the mental radio during the night that he was taking the invisible plane and she is therefore left to her own devices to fly today! Shortly she arrives at the spot Michelle had mentioned near the school and looks around. If her hunch is right and “Glitch” is really Steve’s gremlin friend, then Michelle’s story can only mean one thing – the Alien masters have returned! As she waves her hand in front of her hoping to pick up on some residual trace of the teleportation beam she sees a glimmer of light. She can also detect the faint smell of ozone in the air and as she decides her next steps a nearby passer-by walking his dog suddenly loses control of the animal. 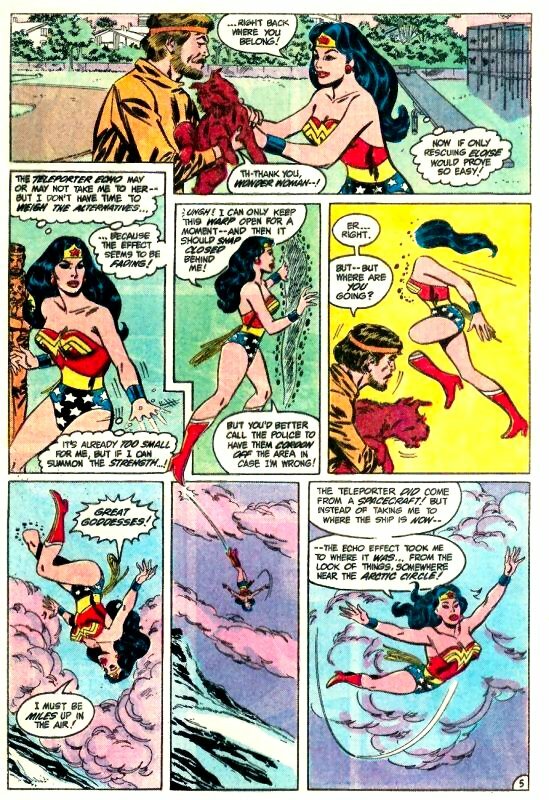 The little dog scampers towards where Wonder Woman stands and leaps up towards her in a friendly greeting. But the animal disappears before her eyes as if jumping through some invisible open doorway. Acting quickly, the Amazon Princess grabs his trailing lead and pulls the dog back from the other side. She hands the dog back to its grateful owner and turns her attention back to the portal. The Teleporter’s”echo” may or may not take her to the same spot that it took Eloise but she has no time to weigh the alternatives. The portal is already too small for her so as she uses her strength to pull apart a wide enough opening, she warns the man with the dog that once she passes through it, the portal should snap closed behind her. However, he should nevertheless get the police to cordon off the area just in case she is wrong. As she steps through the warp he asks her where she is going? She us through before she can answer his question and immediately finds herself miles up in the sky! As she begins to plummet downwards she swiftly controls her fall and glides on the air currents. Obviously, the Teleporterdid come from a spacecraft but instead of taking her to where the ship is now, the echo effect of the transporter has taken her to where it was…somewhere near the Arctic Circle by the looks of things. She thinks to herself that hopefully though, the aliens are still close by. Just then she spots Steve in the robot plane being closely pursued by two Russian MIG Fighters! On board, Trevor is asking the plane how the fighters are able to track them as the robot plane does not generate any heat for them to track and it is supposed to be invisible to radar and eye? The plane replies that it believes the Russians have developed a means of detecting aircraft by observing the airflow they generate. Steve realises that there is no way he can hide his own slipstream and is thankful that at least he can outrun the MIGS. Suddenly though they open fire with air to air missiles which he cannot outrun! using the same tracking technology, they close in on the robot plane as Steve tries to outmanoeuvre them. His efforts to shake them are unsuccessful and he muses to himself that unless he has a guardian angel then he is finished. Just then the missiles veer away towards a giant snowball that is travelling through the air. They strike their new target and detonate in a fireball. Before Steve can wonder what has just transpired Wonder Woman glides up alongside the plane and waves. Soon they have both touched down on a snowy plane and discuss recent events. Wonder Woman asks Steve what is so worth the risky business of invading Soviet Airspace? He explains that satellites had detected a huge explosion in Siberia the previous night and the military thinks it might have been a nuclear bomb test, or perhaps an accident at a major weapons facility. But on further investigation they had realised that the explosion was located in the Tunguska region – the same place as the mysterious blast of 1908! The U.S. and U.S.S.R. both believe that the blast was caused by the crash of a nuclear powered spacecraft! Wonder Woman nods and responds that they both know which spacecraft that had to be – the Gremlins! 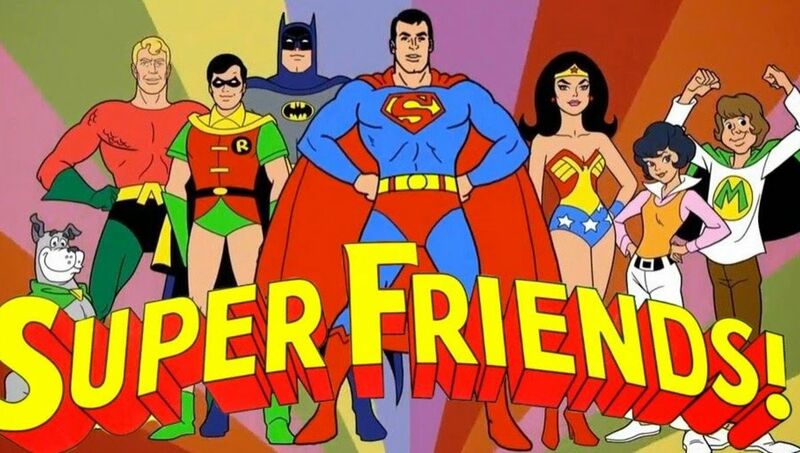 While the Amazing Amazon and Colonel Steve Trevor sift through the facts, there is another who has already turned facts into forecast and determined his course of action! The man known as Garner Grayle streaks through the sky using the rocket powered battle suit he had taken from S.T.A.R. labs. He marvels at its power and the fact that the jet pack has taken him over the Pole in the time it takes to drive around the Washington beltway! But then he needs every moment he can gain because if his predictions are accurate, the Americans will have already entered Russia in response to the alien threat…and that is only one of many possible events in the scenario that could trigger nuclear catastrophe and World War Three! Suddenly, a vision of a woman materialises in front of him and says that only him and her believe that to be the case and so it shall ever be! He exclaims “You again! Cassandra!”. He then adds that this is the very reason he is doing this, because no one will accept the word of Garner Grayle – and only the Atomic Knight can save the world! Meanwhile across the world in the Pentagon, General Darnell is asking Keith Griggs whether Captain Montez is a friend of his? Keith replies that Montez is a Tropidorian officer whom he had rescued from a band of Aztec Worshipping rebels. Apparently, their adventure together had gained Montez some notoriety among the army’s senior staff. General nods and asks that even so, is Keith certain he has expressed a desire to turn against these generals? Keith confirms that this is the message is has r3ceived. Montez has apparently got a group of junior officers together who want to negotiate with the rebels. But that means staging a coup against the Junta which they can only pull off with their help. Darnell replies that what Congress wants is a magical solution – happy results without decisive action! He is sure they would support a man like Montez if they did not have to get their own hands dirty! As he starts a rant about self serving politicians like Senator Covington though, he is interrupted by Etta who nervously informs him that Lisa Abernathy has arrived. He casually tells her to show her in but Etta adds that the journalist is not alone. Lisa then enters the office followed by Senator Covington who Lisa introduces as “Brad”. This immediately raises some eye brows! Covington gets straight to the point and tells Darnell that he was frankly dismayed to learn that Lisa’s daughter had left this office for a drink of water and then simply vanished without a trace! General Darnell replies that in fact he was about to inform Ms. Abernathy that he has put every available resource to work in order to find Eloise. Covington responds that this will not be good enough…not now they know she was stolen by some sort of alien monster who up until now has been the companion of none other than Colonel Steve Trevor! Darnell is dumbfounded by this revelation as the Senator asks the General what sort of operation he is running here? Elsewhere high above the Siberian wastes, Wonder Woman and Steve are making their way to the blast site in the invisible plane. 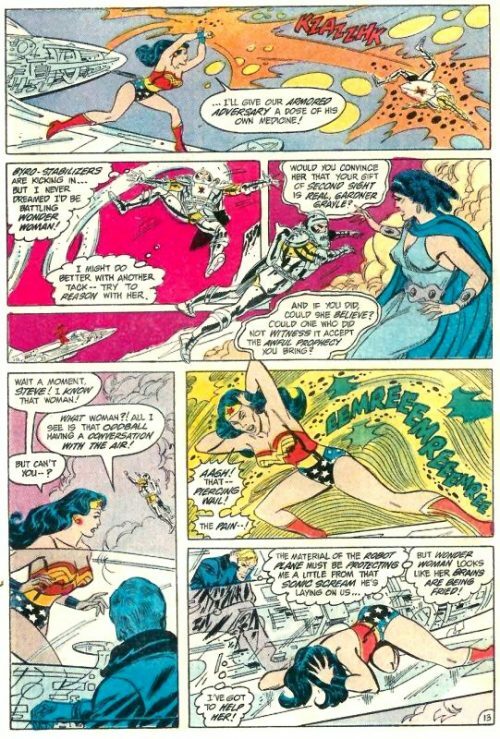 Wonder Woman tells Steve that she had not made the connection that the ship the Gremlins stole from their alien masters caused the Tunguska disaster. Steve responds that it was probably when they jettisoned the nuclear fuel. Wonder Woman then asks what caused yesterday’s explosion? Steve replies that the Russians are asking the same question – they are completely in the dark and scared. She asks how Steve knows this for a fact and he tells her that the gremlin had rigged her mental radio to monitor all types of broadcasts. At last they reach the blast crater and over fly the site. Steve says that while the explosion had been powerful, it was definitely non-nuclear. His guess is that the aliens were excavating for the remains of the crashed ship. Wonder Woman says that might be the reason, but would they come thousands of light years just for that reason, or are they looking for something else? Suddenly the plane is truck by a blast and the Atomic Knight streaks towards them, yelling that their interference will only bring about Man’s worst nuclear nightmare – and he for one refuses to live through that again! He opens fire again with his suit’s weapons and surrounds the plane in an unbreakable stasis field. He tells them he will free them as long as they agree to return back to America. As he talks, he feels the suit’s solar power cells surging with energy and thinks to himself that the suit was designed to work under the reduced light conditions of nuclear winter, so in this situation his power is almost limitless! Wonder Woman for her part sees Atomic Knight speaking with the woman and tells Steve that she recognises her. But Steve cannot see Cassandra. 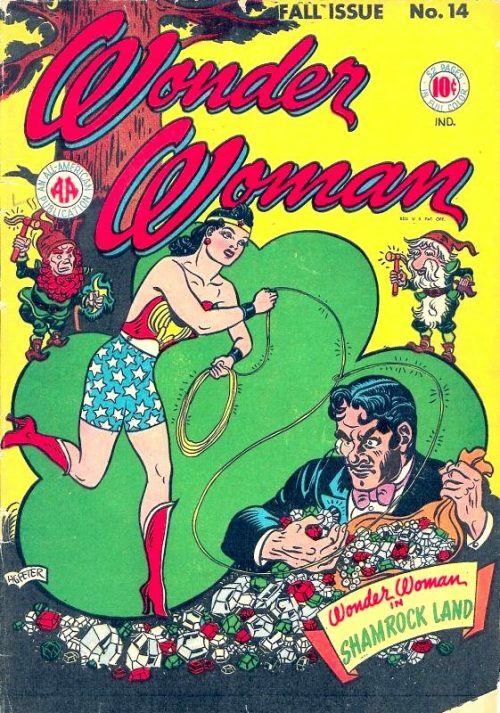 Suddenly, a piercing wail erupts and Wonder Woman clamps her hands to her ears in agony. She collapses on the wingtip while Steve watches helplessly, covering his own ears and thankful that the material of the robot plane must be protecting him a little from the sonic scream. 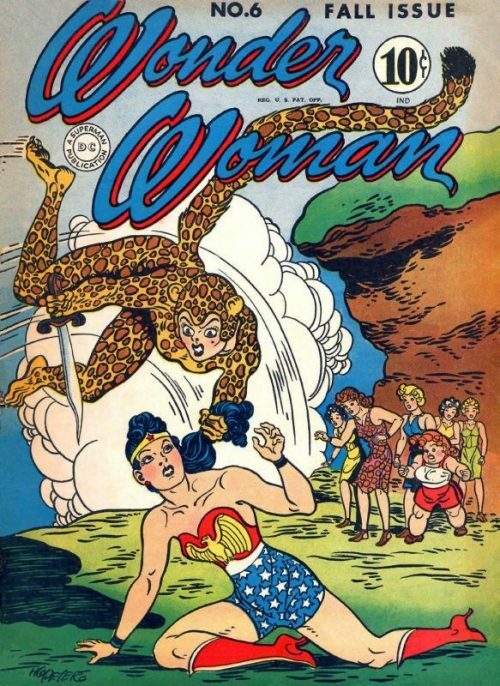 But Wonder Woman looks like her brains are being fried! Using the opportunity to strike, Atomic Knight closes in on the apparently incapacitated Amazon, intending to use his stun gauntlets to finish the battle quickly. 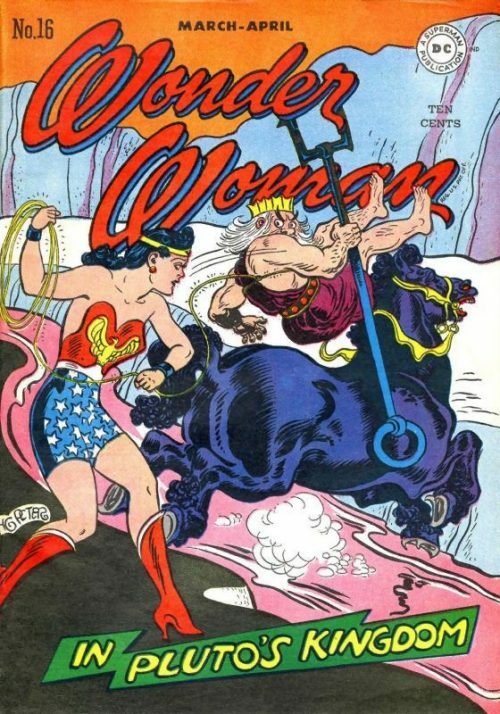 But Wonder Woman does not go down that easily and suddenly turns over, using both her boots to kick him in the stomach. As the surprised Atomic Knight ricochets away she quickly orders the invisible plane to swoop away and strike him down. The plane flips its wing and bats the flailing Knight downwards. 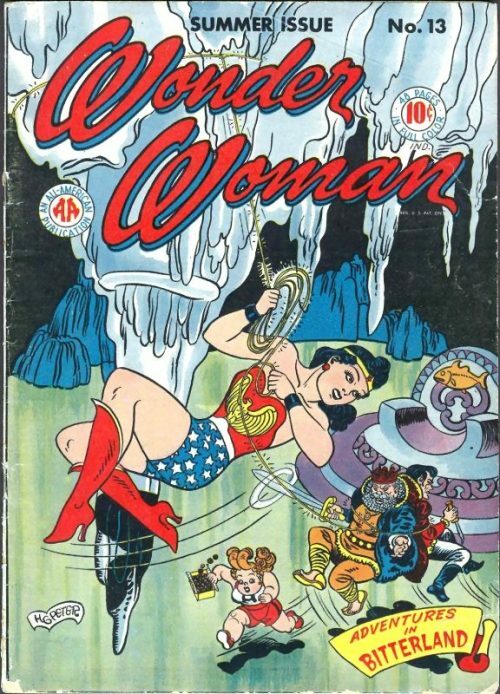 Wonder Woman dives down using the air currents to catch him up. She touches down just ahead of him and catches him in her arms. Shortly afterwards Steve touches down in the plane and walks over the wear Wonder Woman kneels by the stunned Garner Grayle. She removes his helmet as he begins to regain his senses. He sits up and apologises to her for the fight, although the consequences of not stopping her were too horrible to contemplate – it would result in the end of the world. She replies that if he will forgive her she will not simply take his word for that fact. He laughs at this and when Steve asks what is so funny he replies that the Amazon has put her finger on the problem…that no one will take his word for it. He continues that he has been given the gift of prophecy but it has come with a curse…that his predications would never be believed. 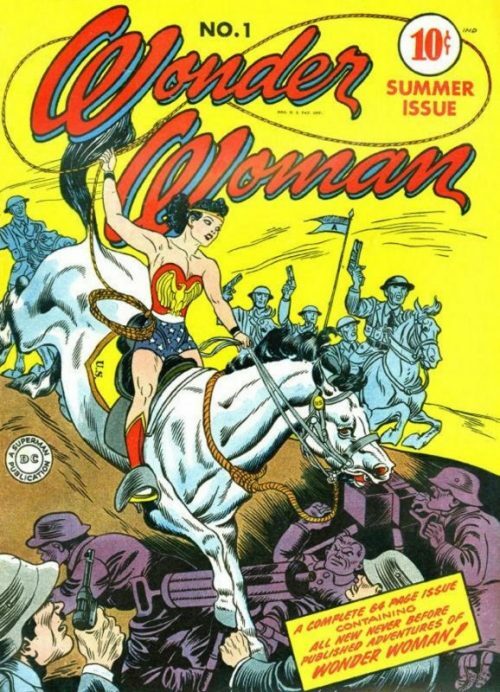 Wonder Woman says that he is just like Cassandra from ancient times – the woman who she had seen him talking to. Garner confirms this, adding that the woman has been taunting him since he got the power. The Amazon Princess then asks him how he came about his power? He replies that it was the result of a computer simulation experiment he had been the guinea pig for. The test was to see how well soldiers could function after a nuclear holocaust (as told in DC Comics Presents #57). But the whole thing went awry and he became trapped in a strange heroic fantasy leading a band of Atomic Knights. After he was free his brain’s long interaction with the computers left him with predictive capabilities. Just then he is interrupted by Steve who points into the sky where Dozens of armed Russian soldiers are parachuting down towards them! 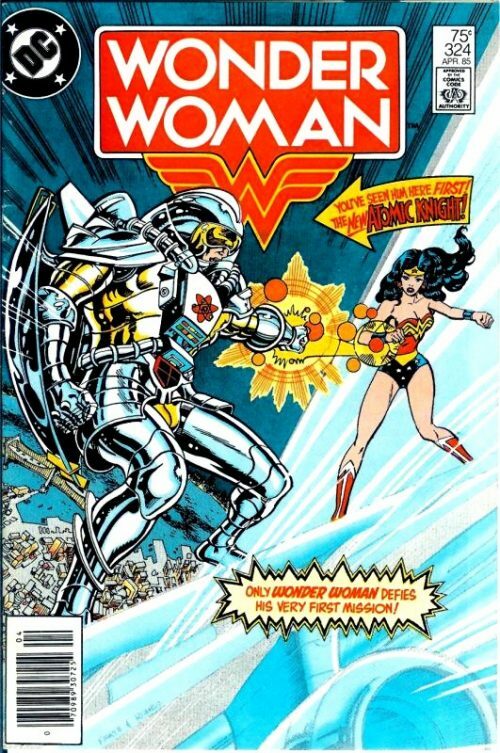 Meanwhile in Siberia, Wonder Woman, Steve and the Atomic Knight find themselves surrounded by armed Russian troops. Speaking in their native tongue, the Amazon Princess tells them that they do not wish a fight and that they come in peace. The unimpressed Russian Commander replies that she make speak their language flawlessly but she comes dressed in the flag of the Imperialist Americans with an American Officer at her side. As she tries to interject that her attire does not mean she herself is an American he sarcastically continues that her other comrade does not wear armour simply to ward off the cold? As he listens, the Atomic Knight thinks to himself that the probabilities are starting to shift. There are still many possible futures but the two that shape up as most likely do not look good and that they both hinge on Trevor’s death! He visualises Steve being gunned down by the Russians and the U.S. military being mobilised in response, culminating in the President pushing the nuclear button. The other scenario sees an enraged Wonder Woman retaliate at Steve’s death leading to the Russians striking back with nuclear weapons. He decides he must act and pushes Steve to the ground before launching into the air with his jet pack. The first thing he has to do is to get the Russian’s attention trained on him instead of Trevor. The Russian Commander orders his men to shoot the Atomic Knight down but he swoops down at them using his shield to block their bullets. Before they can react he uses his own weapon to fire at the ice, melting the Tundra beneath the soldiers’ feet. 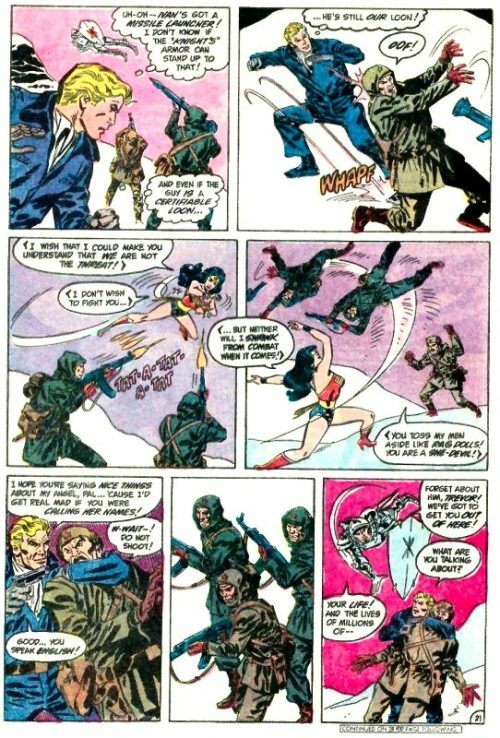 Wonder Woman sees what is happening and grabs hold of Steve’s hand as the Atomic Knight swiftly changes his blast ray from heat to cold, sealing the Soldiers, feet in the re-frozen ice. Steve then sees that one of the Russians has a shoulder launched missile aimed at the Knight and he swiftly decks the soldier before he can fire it. At the same instant Wonder Woman is using her bracelets to protect herself from a barrage of fire from two more Russian soldiers. She tells them she does not wish to fight them but they leave her no choice. With that she flips them across the Tundra and seeing her toss his men like rag dolls, the Russian Commander accuses her of being a she devil! Steve uses his distracted state to creep up behind and grab him, holding a revolver to his head. Seeing their Commander is now a hostage the soldiers hold their fire, wondering who will make the next move. The Atomic Knight swoops down again and tells Steve to forget about the Russian as they have to get him out of here as soon as possible. When Steve asks what he is talking about he replies that Steve’s life and lives of millions depends on it! But before he can grab Steve he suddenly finds his arm ensnared by the magic lasso. Wonder Woman drags him down to the ground saying that she cannot rely on prophets and that she has to do what her conscience dictates. She then turns to Steve and asks whether his own conscience will let him do things her way? He replies that the whole world is not like Paradise Island and that at the end of the day he is a soldier while the Russian is his enemy! But reluctantly he drops the weapon and releases the Commander, adding that he guesses they must all show a little faith sometimes. The enraged Commander orders his men to seize Steve and asks Steve if he will perhaps give him some reason why he should not kill him? A horrified Wonder Woman shouts out “Stop! You Can’t!” and the watching Atomic Knight muses that they will! Steve Trevor will die…and then there will be no stopping the events that he has predicted. But his thoughts trail off as a dark shadow crosses over the Tundra. Everyone looks up into the sky as the massive alien vessel lowers down from the clouds. A booming voice orders all forces to surrender as the area is now under the control of the Ytirflirk Armada! The Earth will shortly be in their complete control and following their mission here…it will be destroyed!